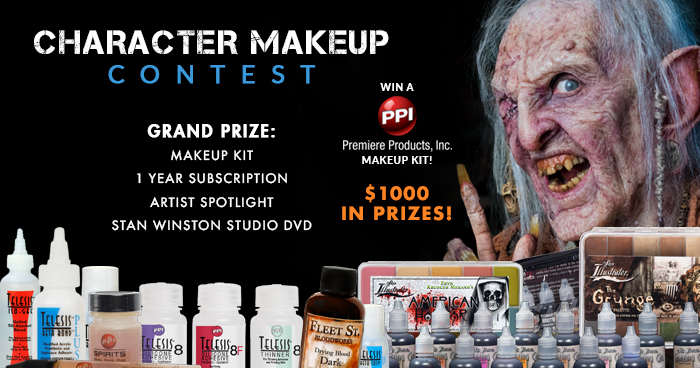 To enter this contest simply post a new discussion in the "CHARACTER MAKEUP" category. Please include a description and high rez pictures of your character makeups. Video submissions are cool, too! Just upload your video to YouTube and share the link in your post. To be considered, all entries must be character makeups applied to a person, and may incorporate any of a number of makeup techniques, including painting, build-up techniques, prosthetic appliances, dentures, lenses, and hair work. Entries can be an original design or based on a well-known character, as long as the makeup itself is primarily the work of the entrant. Have you created a bunch of impressive character makeups? Not a problem! You can submit as many as 3 entries to the contest. So share your character makeups and you could win the Grand Prize! Grand Prize Pack: Over $1000 in prizes! 1 Year UNLIMITED Subscription to SWSCA - $359.94 value! 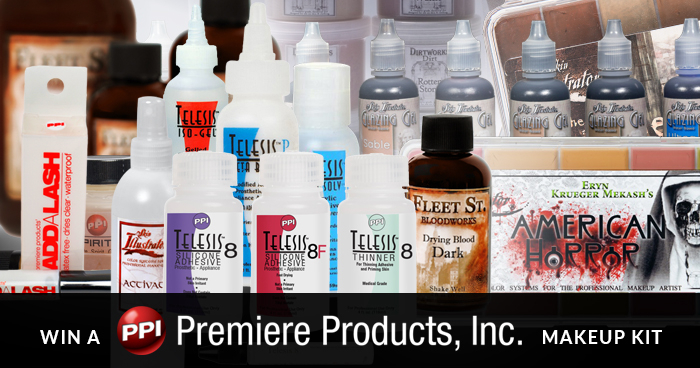 Makeup Effects Kit - Sponsored by PPI Premiere Products Inc. - Over $700 value! 1 Super Solv 4 oz. 1 Beta Bond Adhesive 2oz. 1 Beta Solv Remover 2 oz. 1 Top Guard Skin Prep Spray 2 oz. 1 Fleet Street Fresh Blood 2 oz. 1 Fleet Street Dark Blood 2 oz. 1 Iso Gel 2 oz. 1 Telesis Makeup Remover 4 oz. Your submission will be reviewed by the team at Stan Winston School of Character Arts and judged based on quality of work. Prior to judging you can update or remove your entries as often as you like. Once the contest has ended, our judges will review all submissions and the winner will be announced. To be considered for the contest, all entries must be posted by Friday, March 9th, 2018. 4. CONTEST ENTRY: All submissions can be based on either an existing character or an original design, as long as creating and applying the makeup is primarily the work of the contest entrant, and received by the date and time outlined on the Website(s). For purposes of these Official Rules, “receipt” of Entry occurs when Sponsor’s servers record the Entry information resulting from contestants’ entry being posted in the SWSCA CHARACTER MAKEUP CONTEST forum category. Any automated computer receipt (such as one confirming delivery of email) does not constitute proof of actual receipt by Sponsor for purposes of these Official Rules. By entering this contest, you grant SWSCA the irrevocable right to share your submission photos and/or videos on our website, email, and social media channels, copyright is retained by original author. Sponsor reserves the right to disqualify any Entry for any reason, in its sole and absolute discretion. Odds of winning depend upon number of entries received. 8. GENERAL CONDITIONS: Sponsor is not responsible for lost, late, misdirected, damaged, stolen, altered, garbled, incorrect, incomplete or delayed Entries, all of which will be void. Sponsor is also not responsible for problems related to technical malfunctions of electronic equipment, computer online systems, servers, or providers, computer hardware or software failures, phone lines, failure of any Entry to be received by Sponsor on account of technical problems, traffic, congestion on the internet or the Website, or for any other technical problems including telecommunication, miscommunication or failure, and failed, lost, delayed, incomplete, garbled, or misdirected communications which may limit a contestant’s ability to participate in this Contest. Sponsor is not responsible for any other errors or malfunctions of any kind, whether network, printing, typographical, human or otherwise relating to or in connection with the Contest, including, without limitation, errors or malfunctions which may occur in connection with the administration of the Contest, the processing or judging of Entries, the announcement of the prize or in any Contest-related materials. Mass entries generated by a script, macro or use of automated devices will be disqualified. Sponsor reserves the right to modify, suspend or terminate the Contest in the event it becomes infected by a computer virus or is otherwise technically impaired, and to cancel or suspend the Contest in its entirety should tampering, unauthorized intervention, fraud, technical failures or other causes corrupt the administration, security, fairness, integrity or proper play of the Contest and, if terminated, at Sponsor’s discretion, determine the Winner using all non-suspect, eligible entries received up to time of cancellation using the judging procedure outlined above. In the event of a dispute regarding entries received from multiple users having the same email account, the authorized subscriber of the email account at the time of Entry will be deemed to be the contestant and must comply with these Official Rules. Authorized subscriber is the natural person who is assigned the email address by the Internet Service Provider (ISP), online service provider, or other organization responsible for assigning email addresses. Sponsor reserves the right at its sole discretion to disqualify any individual (and void his/her Entries)) it finds to be tampering with the Entry process or the operation of this Contest or website, intending to annoy, abuse, threaten or harass any other contestant, Sponsor, or any of its representatives or to otherwise be acting in violation of these Official Rules. How do I post? I would like to add a few entries of whar I've done. Thanks! @Charles A. Arrigo to post your entries, go to the contest category and click the "New Discussion" button on the top left of your screen. Make sure to provide a title, description, and photos of your work. Good luck! Only moderators and admins can delete content, so I can do that for you. Just let me know the URLs or titles of the 2 entries you want deleted. Hi @Ruth Parry I moved both posts out of our contest category and into the Makeup Effects category, so they can still be viewed, just not as part of the contest. Apologies for the name being wrong, the auto complete selected another user with the same last name. Hi @Chris Ellerby i have photo of a character that i want to use in the competition but the costume is designed by someone else as a collaboration with a costume designer i had. is that a problem or if credit them i can still use it in the competition ? Why are photos disappearing with my works for the contest? I noticed that you corrected my entry, leaving only the video where I'm doing Xenomorph, the photo was deleted. What is the reason ? It is an accident ? No photos should have been deleted. Can you provide me a link to the entry in question? Some entries had photos improperly included as attachments, and not embedded into the post, so that may have been part of the issue. I added the photo you provided to the original post.